6"/40 (15.2 cm) guns on HMS Hermes. The original postcard is titled "Captain Scott's Dotter" which was a mechanism used to teach gunsighting techniques. Photograph courtesy of Brian Cave and Paul Benyon. These guns were used on most pre-dreadnoughts and cruisers built between 1890 and 1905. The Mark I and Mark II were only slightly different in construction and are normally listed together in armament lists. Mark III was a trunnioned version of the Mark I. Mark I was EOC Pattern "Z" and was of built up construction while Mark II was a Woolwich design. The Mark III was known to EOC as "Z1." All used a 3-motion breech mechanism but most were later converted to a single motion breech mechanism. Guns so converted had a "B" added after the Mark number. A total of 137 Mark I, 760 Mark II and 53 Mark III guns were made for Britain. In addition, numerous 6" (15.2 cm) EOC guns of the same or similar designs were made for other countries, including Italy and Japan. Some British guns were employed as AA weapons during World War I, but this did not prove very successful. 63 Mark II guns were transferred to the Army, where they were bored out and converted to 8" (20.3 cm) howitzers. Nomenclature note: The 6"/45 (15.2 cm) QF Mark IV designation was given to twelve guns purchased from the USA firm of Bethlehem Steel early in World War I. Eight of these were used in coastal defenses at Scapa Flow and four were used on DAMS. These guns may actually have been the Bethlehem 6"/44 (15.2 cm) Mark 9 or a close relation. ^Campbell in "British Naval Guns 1880-1945 No 11" says that these guns were used to rearm HMS Superb. There is some evidence to support this in "British Battleships: 1860 - 1950" by Parkes, but this is contradicted by other information contained in that same work which says that Superb was rearmed with 6 inch (15.2 cm) BL guns. 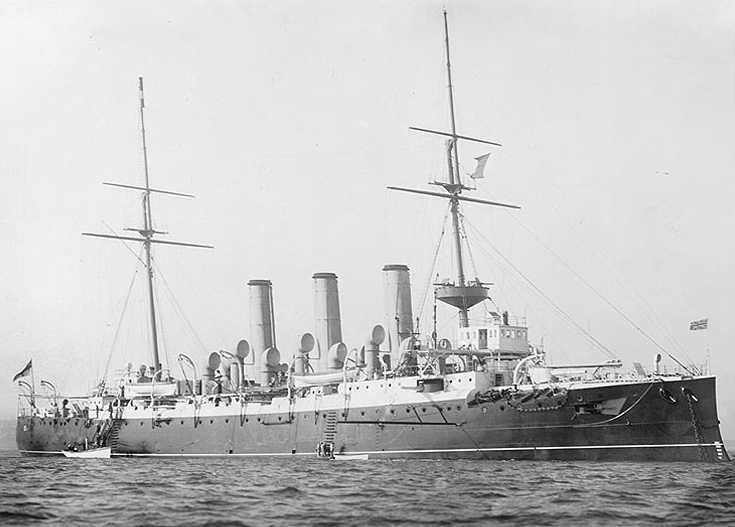 As Superb was reftted between 1887 to 1891, this predates the introduction of the 6"/40 (15.2 cm) on the Royal Sovereign class. For these reasons, I believe that Superb was actually rearmed with 6 inch (15.2 cm) BL guns. ^Mark I guns were used with CPI mountings. ^Many of the cruisers had a secondary battery of 4.7 (12 cm) guns that was later replaced with more 6" (15.2 cm) guns. Powerful class was later given 12 guns. Arrogant class later given 10 guns). Eclipse class (except for Eclipse herself) were later given 11 guns. ^A total of four CPI and twelve PII mountings were converted for AA use. The Monitor Roberts was given a Mark I gun in one of these HA mountings in 1916. HMS Furious in 1898. 6"/40 (15.2 cm) gun in bow pedestal mount. U.S. Naval Historical Center Photograph # NH 61062. 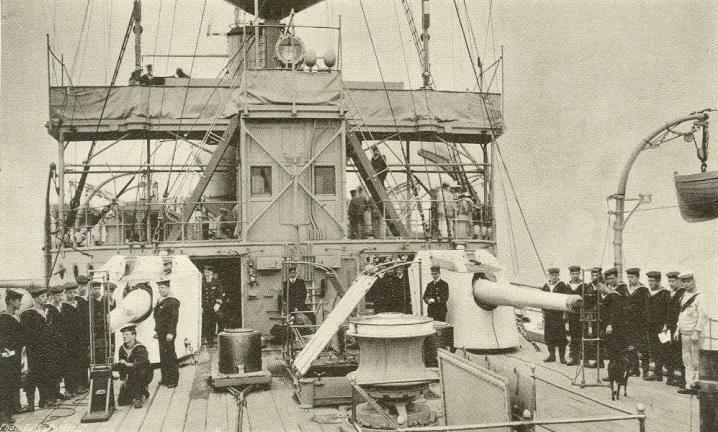 6" (15.2 cm) gun on HMS Ariadne ca. 1903. 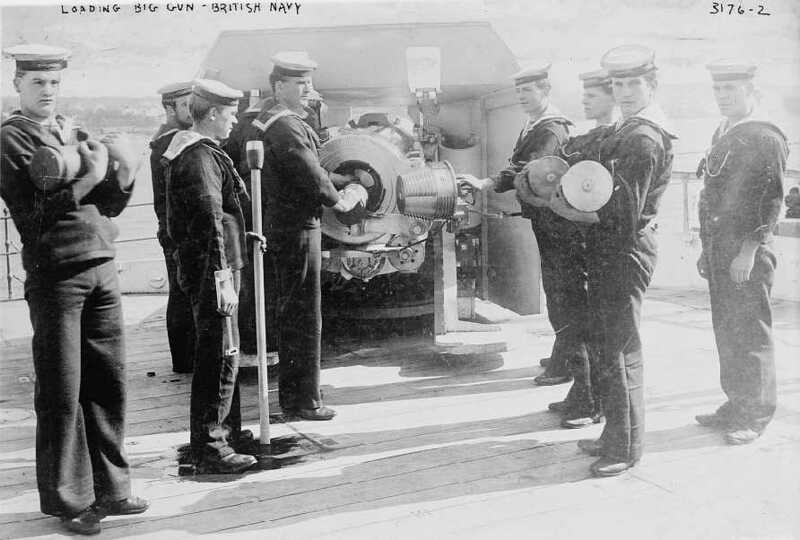 Note the three motion breech and sailors holding rammer, projectile and propellant casings. Bain News Service Photograph. Library of Congress Photograph ID LC-DIG-ggbain-16785. Notman Studio/Library and Archives Canada Photograph PA-028473. Images at The Vickers Photographic Archive. See photograph 6487.